When Georgia-based animal wrangler Renee DeRossett heard that Gov. Sonny Perdue was signing a law upping her state’s entertainment production tax credit to as much as 30%, she could barely contain her joy. It may seem like a silly thing to get so excited about, but for people like DeRossett, incentives such as these can mean the difference between buying a bigger, more expensive home and facing foreclosure on a smaller, cheaper one. Click here to read my latest article about Georgia production in Variety. The vast majority of industryites -- from left-leaning opponents of corporate welfare to right-leaning anti-government types -- seem to agree on one thing: Domestic production incentives -- which are offered in 40 U.S. jurisdictions, including Puerto Rico and the District of Columbia -- are good news for them and for their local economies, and it's not hard to see why. On the surface, attractive incentives lure Hollywood productions that create jobs and spend money in the communities. But the net benefit of incentive programs is complicated, controversial and frequently misunderstood. Click here to read the full article from Variety. From Lucasfilm's "The Young Indiana Jones Chronicles," immediately post-Velvet Revolution in 1990, to the upcoming Amazon/Sky Channel historical drama "Britannia," I examine the evolving state of film and TV production in the Czech Republic in Variety. When Oliver Stone made "The Doors" (1990), he painstakingly restored large portions of the Sunset Strip between Larrabee St. and Hilldale Ave. to their mid '60s glory. I know because I was able to observe it from my office overlooking what is now the Viper Room. I'm embarrassed to say that I was also around for hair metal's heyday in the late '80s, when on Saturday nights the Strip was so crowded with wannabe rock gods and Spandex-ed vixens it looked like someone had turned the Midwest upside down and shook loose every Aqua Netted idiot on to the streets of West Hollywood. So maybe I should be relieved that director Adam Shankman has gone to the other end of the country to Miami, Florida, recreate that milieu for his Warner Bros. big screen adaptation of the musical "Rock of Ages," starring Tom Cruise. If you want to know why "Rock of Ages" and so many other productions are now choosing to shoot in the Sunshine State, read my article in Variety. ​Here are some photos of the "Rock of Ages" set in Miami, along with a covert video tour. For years, the closest the city of Holland, Mich., got to big time show business was its annual Tulip Time Festival. 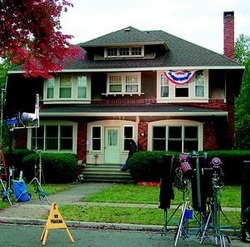 That all that changed in April 2008 when the state enacted a film and TV incentive package highlighted by a refundable tax credit of up to 42% of in-state production spend and a 25% tax credit for film and digital media infrastructure investments. It's an inspiring scene, one that the other 40 U.S. states currently offering significant production incentives would like to see playing out in their cities and municipalities. A recent survey by the Associated Press estimates that states gave $1.8 billion in tax breaks and other incentives to the entertainment industry from 2006-08, as they've progressively one-upped one another with more generous tax credits. But with Michigan facing a $2.7 billion budget shortfall and other incentive states in similar dire economic straits, can they really justify the expense of these tax credits? Now, instead of just asking, "How much are you offering?" people... must also ask, "Is the money really there and am I going to get it in the end?" Producer Kelli Konop almost didn't get hers for "The Baster" [later retitled "The Switch"] starring Jennifer Aniston. The feature received its initial approval for New York State's 30% tax credit this year. A few weeks later, Gov. David Paterson said New York had exhausted the $690 million allotted to the program through 2013 in a mere 10 months and, with the state facing a $13 billion deficit, he was not including additional funding in the next year's state budget. Even the suits are feeling the pain as a growing number of film and TV productions shift away from California. Director Brad Silberling recalls a recent poignant visit by Universal chairman Marc Schmuger to the set of his upcoming comedy "Land of the Lost." "He was just shaking his head," Silberling says. "He said, 'This is the only feature this studio has shooting on the lot.'" To find out more about how far producers will to go to get a bargain, check out some of my other location reports -- Louisiana 2015, Hawaii 2014, New Mexico 2014, Hawaii 2013, Fiji 2013, Pennsylvania 2013, Shooting Steven Spielberg's "Lincoln" in Virginia, Puerto Rico 2012, Northern California 2012, Massachusetts 2012, New Mexico 2012, Scout and About: Florida, U.S. Update 2011, Location Managers Plan World Shoots, Puerto Rico, Dominican Republic, Scout and About: Canada, Relativity Media Puts Muscle Behind Incentive Legislation, Scout and About: Georgia, Made in Utah, Made in Colorado, Made in Hawaii 2009, Made in Hawaii 2010, Hawaii Sizzles with Location Shoots, Made in Oregon, Made in Alaska, Made in Florida, Made in North Carolina, Made in Louisiana 2008, Made in Louisiana 2010, New Orleans: Bracing for the Next Storm, Made in San Diego, Locations 2003 and Locations 2010.